Popular Electronics wanted to be all things to all people as far as electronics hobbyists go. 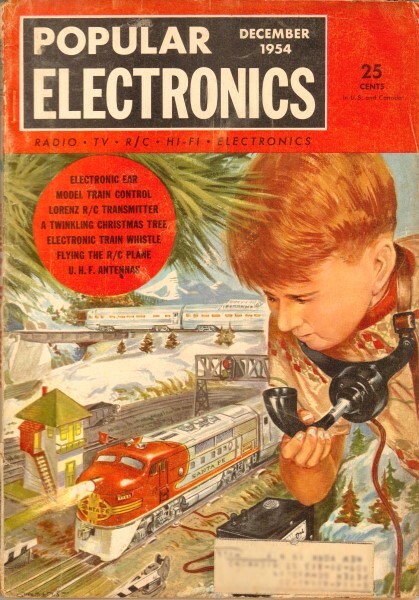 From the very first edition in October of 1954 (2 prior to this one), they included articles on circuit troubleshooting, electrical theory, DIY building projects, Amateur radio, radio control airplane enthusiasts, and much more. I don't have the first two issues yet, but I'm guessing that the first or second After Class column covered aspects of direct current (DC), since this installment covers alternating current (AC). An alternating current is one which periodically reverses its direction. This is illustrated in Fig. 1. At A, when the polarity of the line is as shown, electrons flow through the circuit in the direction indicated by the arrows. A short time later, the polarity of the power line reverses and the direction of current also reverses as shown by the arrows in B of Fig. 1. Usually the current changes gradually with time from maximum in one direction to maximum in the other direction. This change can be represented by a drawing such as shown in Fig. 2. This drawing or graph shows that the current rises from zero at time L to its peak value at time M. The current then decreases until it reaches zero again at time N. It now reverses direction and builds up until it reaches its maximum value in the opposite direction at time O. The current then decreases until it once more drops to zero at time P. The variation of current between time L and time P is known as one cycle. The number of such cycles which occur in one second is known as the frequency. For example, the usual power line frequency is 60 cycles-per-second; this means that one complete cycle will have a duration of 1/60 second. The frequencies used in radio and television broadcasting are much higher than the power-line frequency and are usually specified either in kilocycles (kc.) or megacycles (mc.). A kilocycle is equal to 1000 cycles, and a megacycle is 1,000,000 cycles. What is the r.m.s. 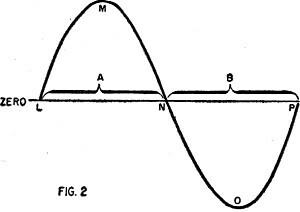 value of an alternating current whose peak value is 3 amperes? What is the peak value of an alternating voltage whose r.m.s. value is 10 volts? Unless otherwise stated, alternating volt­age or current is specified in r.m.s. values. For example, when we speak of the 110- volt power line we mean 110 volts r.m.s. Likewise a.c. values given on a circuit diagram are assumed to be r.m.s. unless otherwise noted. Unless designed for specialized applications, a.c. meters are calibrated to read r.m.s. values. The r.m.s. value of voltage or current is also called the effective value, since it gives the number of volts or amperes of d.c. which would produce the same effect, in heating, for example. Depending upon the components of a circuit, the current and voltage may be either in-phase or out-of-phase. When they are in-phase, current and voltage reach corresponding peaks at the same instant and pass through zero at the same instant, as shown in Fig. 4A. If the current either leads or lags the voltage, the two are said to be out-of-phase. These conditions are illustrated in Figs. 4B and 4C. The amount by which current and voltage are out-of­phase is known as the phase angle and is usually specified in degrees (one complete cycle = 360°). Phase angles are often indicated by means of drawings such as those in Fig. 5. Here, arrows instead of sine waves are used to represent the current and voltage. These arrows are known as vectors, and the drawing itself as a vector diagram. The lengths of the vectors indicate the amounts of voltage and current. These are often drawn on graph paper where each square represents a certain number of volts or amperes. Vectors are considered to be pivoted in the center and rotating in a counter-clockwise direction. The three vector diagrams in Fig. 5 present exactly the same information as the three drawings of. Fig. 4. In A, the current and voltage are in phase. In B, the current lags the voltage. In C, the current leads. The following quiz is intended as a self-check. You should be able to answer all of the questions correctly if you have mastered the foregoing text. The answers appear on page 128. 1. What is the r.m.s. value of a sine wave having a peak of 300 volts? (a) 1.5 mc. ; (b) 1.5 cycles; (c) 1,500,000 mc. 3. What is the peak value of a 220 volt r.m.s. power line? The odd behavior of a common voltmeter when used to measure the plate potential of an electron tube amplifier is very mystifying unless one remembers that the meter itself is a part of the circuit being measured. This idea will be clarified by referring to the schematic diagram of the resistance­capacitance coupled amplifier shown in the diagram. If the amplifier is performing properly ­ and this we shall assume - it is fair to anticipate a voltage drop of perhaps 150 volts in the plate load resistor, R. This would leave 150 volts for the plate. A voltmeter, connected as shown in the diagram, ought to read this voltage but, surprisingly, it will probably register a great deal less - possibly as little as 10 or 15 volts. If your reaction to this reading is to conclude that the meter is delinquent, forget it! You couldn't be wronger! But the fact remains that the plate voltage has vanished! Where? The explanation involves two distinct considerations: first, the ordinary voltmeter generally requires about 1 ma. of current through its coil to make it read full scale; second, this additional current is being drawn through a relatively high resistance, that of the plate load resistor R.
With the meter disconnected from the circuit, the voltage drop across R is, as mentioned, about 150 volts. The fall of potential results from the flow of plate current through the resistor which, of course, is in series with the tube plate circuit. Just as soon as the meter is connected from plate to ground it, too, draws current to make its needle deflect, producing an additional voltage drop which may be quite high. On the other hand, the decrease in plate voltage will produce some decrease in plate current. For example, let us suppose that our tube is the triode section of a 12SQ7GT, with -1.5 volts grid leak bias. The plate current will be approximately 0.31 milliampere, the voltage drop across R will be 0.00031 x 500,- 000, or 155 volts, and the plate-to-cathode voltage will be 145 volts. Now suppose we connect a 1000 ohms-per-volt meter, set to its 250-volt range, between the plate and cathode of the tube. The meter reading would be approximately 94 volts. With this plate voltage and the same bias as before, the tube would draw only 0.036 milliampere. The meter, which draws 1 milliampere for a full-scale reading of 250 volts, would draw 94/250 or 0.376 milliampere. The total current through R would be 0.376 plus 0.036, or 0.412 milliampere. The total drop across R is 0.000412 x 500,000, or 206 volts. 300 minus 206 equals 94 volts. If we set the meter on its 100-volt range, the reading would be approximately 50 volts. 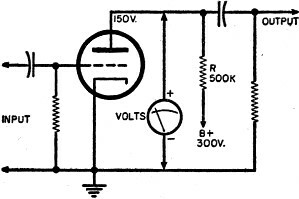 With this plate voltage, and bias as before, plate current of the tube would be practically cut off, and meter current would be 50/100, or 0.50 milliampere, which is enough to account for the entire 250·volt drop across R. Similarly, on the 50-volt range, the reading would be approximately 27 volts, and on the 25-volt range, 14 volts. The lower the range we use, the less the resistance of the meter will be, the more current will flow through R, and the greater the voltage drop across R will be. Colloquially, this is known as "loading down" the circuit. The only way to avoid it is to take all such measurements with a good vacuum-tube voltmeter (v.t.v.m. ), an instrument which draws practically no current at all through the plate load. Modern fluorescent lighting tube emits light as a result of the excitation received by its inner, chemical coating from the ionized gas contained within it. A somewhat unfortunate characteristic of ionization is that the striking potential required is much greater than the operating potential. Ordinary household fluorescent lighting fixtures must incorporate a starting scheme which applies a sudden surge of high voltage across the tube, - voltage which is removed once the arc has been struck. Two methods for obtaining starting potentials are now in common use. The first, generally found in desk and floor lamps, is a manual starting system requiring a spring push-button (see diagram A). 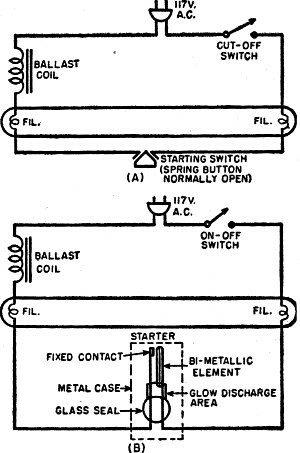 A ballast coil having a relatively high inductive reactance is in series with a filament at each end of the tube and with the starting switch. When the switch is closed, current flows through the series circuit causing the filaments to heat and emit electrons but no arc discharge can occur between them because the closed switch keeps the potential difference quite low. When the button is released, however, the usual inductive voltage kick-back appears across the tube of sufficiently large magnitude to initiate the discharge. Once started, the arc continues since the voltage across the tube is in the region of 100 volts. To extinguish the light, a separate series switch is incorporated in the line to open the circuit. Ceiling fixtures use an automatic starting method involving plug-in starters. A starter is a rather interesting combination of glow-discharge tube and a bi-metallic element. The latter is made by bonding together two dissimilar metals having widely different coefficients of expansion; when heated, such an element bends, with the metal having the lower coefficient on the inside of the curve. In diagram (B), the bi-metallic element is shown straight and upright; application of heat, however, would cause it to bend toward the contact point. When the unit is switched on, a glow discharge begins in the area indicated in the diagram. The heat from the discharge is conducted to the bi-metallic element, causing it to bend toward the contact point and close the circuit. Now the filaments heat up since a complete circuit through the filaments has been established through the ballast coil, but the little glow discharge ceases since the contact between the bi­metallic element and the point has short­circuited the discharge path. The bent bi-opening, the same inductive kick-back encountered in the manual case appears to initiate the discharge arc. Once the lamp discharge starts, the voltage across the starter is not high enough to restrike the glow and it remains out.